A lawyer for Yemeni inmate Samir Mukbel told AP she had been notified by the Department of Justice last week that her client was being fed against his will. On Monday, she was allowed to speak with the prisoner over the phone, and confirmed the Department’s report. The inmate reportedly told her that he joined the hunger strike in February, has lost over 10 kilograms in weight, and fainted at one point and had to be taken to hospital. He described the feeding process as painful. “Some people have gone through this a lot but he said he had never felt anything like it in his life,” lawyer Cori Crider pointed out. Prison’s spokesperson Robert Durand said he was aware the government was notifying lawyers whose clients were being force-fed, though he did not know the reason for the change. The news comes after the Department of Justice repeatedly refused to comment to RT about the hunger strike through the end of March. “The Defense Department oversees the detention facility at Guantanamo Bay and is responsible for its operations – not the Justice Department. 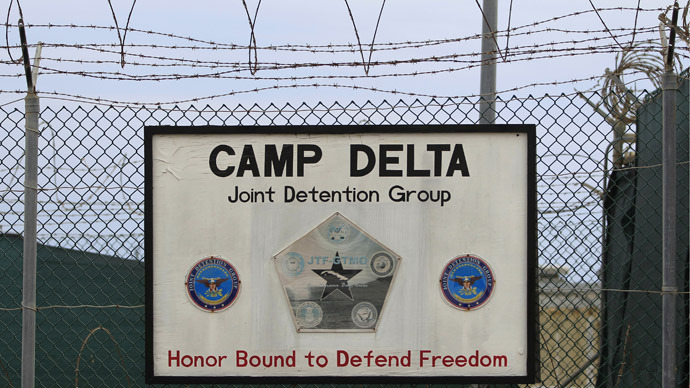 I suggest you reach out to the Defense Department office of public affairs for any interview regarding the status of detainees at Guantanamo Bay,” the Department’s spokesperson wrote in an email. Most of the 166 inmates were participating in the hunger strike, the prisoners’ lawyers indicated, while the facility’s spokesperson indicated to RT that 41 inmates were classified as hunger strikers, with none of them currently in hospital.